Sometimes life is sweet. People think good thoughts. Folk are inspired to imagine and drive forward a happier, more contented society where we live good lives in good places with economic and political democracy. A little bit of that dream came alive this week. Check out the picture gallery. Last week also saw an important event in making such places more easily available to thousands of Scots who would like them. Scottish planning policy is not most folk’s idea of fun but the quality of where we live, work and play depends on a robust land use planning system and and (equally as important) a robust and democratic system of making decisions about land allocation. One thing that the SNP Government has been good at is raising the profile of planning in Scotland. I don’t agree with all their policies but that is irrelevant for the moment. Planning now has a higher profile and that is good. This is reflected in the new National Planning Framework 3 and Scottish Planning Policy published by the Scottish Government. But this is not a blog to discuss the weighty issues contained in these documents. I may do that later. Paragraph 69 of the Scottish Planning Policy concerns Development Plans in rural Scotland and the third bullet point is as follows. 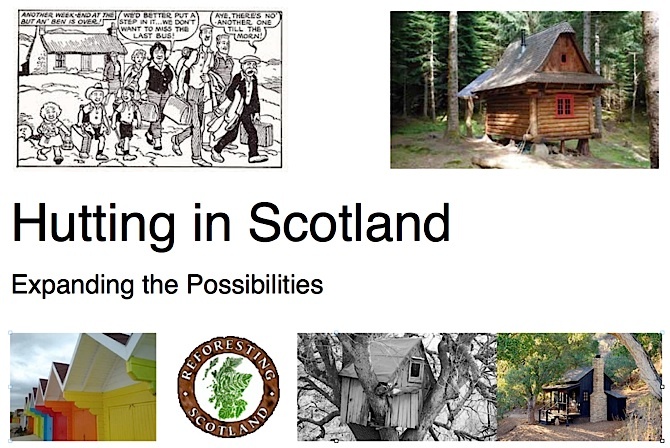 For the first time ever in the history of land use planning in Scotland there is a proposal that hutting be encouraged, facilitated, and expanded. A few weeks ago I was part of a delegation from Reforesting Scotland’s thousand huts campaign that met with the Scottish Government to discuss huts. Both officials and Ministers have been very supportive and what has appeared in the document this week is the culmination of a good deal of work over the past few months. Of course the Scottish Planning Policy refers to planning policy. It is vital that if hutting is to expand and thrive that all local authorities have a policy on the topic. But there is more to do. For example, planning law does not even contain a class for “huts” and neither do the Building regulations. So, even with the most enlightened policy on hutting, it is next to impossible to actually apply for planning consent. Which is why, earlier this year Bernard Planterose and myself were asked to prepare a paper (download copy here 3.2Mb pdf) outlining how planning law and building regulations might be reformed. This was presented to Ministers in January together with a technical annex. Building on my previous blog on the consultation on reforming allotment legislation, this consultation on planning policy might represent the beginning of a new vision for how we use the land in around Scotland’s towns and cities. Not as a place for land speculation and grim retail and peri-urban development but as a green oasis under the democratic control of the townsfolk to grow food, walk and play and, a little further out in the woods to have some huts. Already, the Carbeth Hutters have secured their own future after decades of struggle. None of this will happen if folk don’t respond to the consultation and let the Scottish Government know what a wonderful idea this is. Full details on how to respond are here. You have until 23 July but what about doing it now and certainly before the end of May? Please also respond to the Allotments consultation as highlighted in a previous blog. Allotments, suburban gardens, greenspace, huts, community forests and community farms should all be part of a continuum of civilised spaces for people and nature. 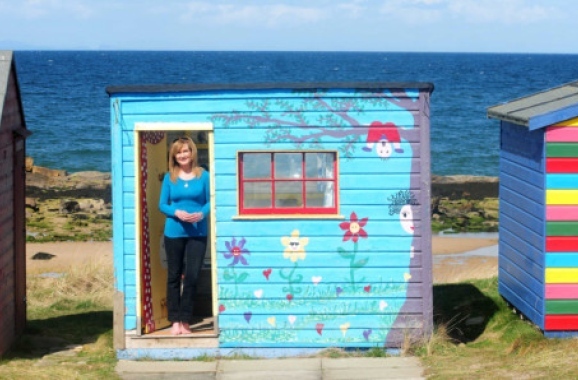 If you do, then not only can many more folk like Liz Grey get hold of a hut but Scotland could be transformed by providing all ages, classes and genders of town and city dwellers with a place to enjoy the sights, smells and sounds of Scotland’s wonderful countryside. I do wonder however if those who have second homes should be vilified. I live beside several huts which are used as homes all year round. They are comfortable and well looked after. How is that different from an old cottage saved or rebuilt from dereliction? I know there is an issue of lack of affordable housing in places like Mull but that is an issue of land which should be addressed nationally and by taxation of land. In other countries. people are encouraged to have their rural retreats including the most progressive social democratic Nordic countries. Surely we should encourage people to holiday at home and spend their money in ascidians and second homes including huts serves this purpose. Great news and an example of the long days and months you have devoted to this. The elephant which will come walking through that hut door any moment now is, as you say, Planning and its big brother Building Control will be right behind. How many huts will be condemned for poor foundations, poor electrics, poor water supply, poor insulation, poor whatever else could short circuit the progress made to date. This should be one area where our public voice, through the consultation process, determines building (hutting) standards rather than engineers or EU bureaucrats. Planning law (hut class) and building regulations are being discussed within Scottish Government by folk quite sympathetic to hutting. i think the problems (if they arise) will come from the interpretation placed on whatever framework emerges by individual local authorities. But we have the opportunity to shape this from the very start so hopefully such problems should be minimised. Huts are popular in Bavaria too, usually on an allotment. Occasional problems when folk decide to turn them into homes, in breach of the planning laws.